This ultra-simple remote control extender is ideal for use with a hidden video recorder. The recorder is a Panasonic NV-SD200 and is used as part of a camera surveillance system. A PICAXE-08-based circuit is used to detect events and control the recorder. It also flashes a LED near the monitor to indicate the number of events since last viewing. Strangely, the NV-SD200 model refused to work with a number of commercial infrared remote control extenders, hence the need for this design. As a bonus, it uses less power than a traditional extender (no plugpacks) and the remote can still be used in the normal manner. As shown, an additional 5mm infrared LED is mounted directly in front of the equipment to be controlled. This is cabled back to a convenient location near the monitor and terminated in a 3.5mm plug. 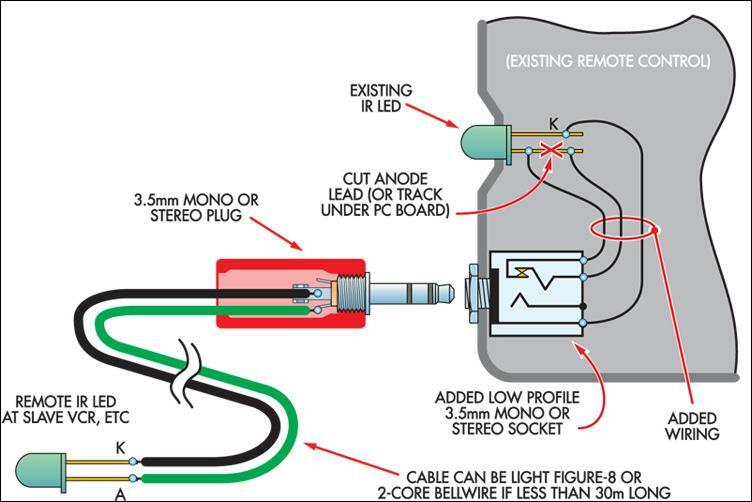 To modify the remote control unit, break the circuit to the anode of the existing infrared LED and wire in a 3.5mm headphone socket. In most cases, the LED will be accessible without dismantling the circuit board. 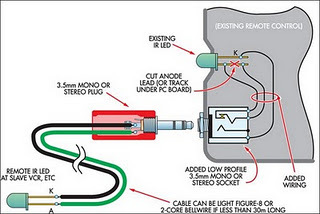 The purpose of the socket is to allow the existing infrared LED to operate normally when the jack is unplugged. If the socket won’t fit inside the case, then a very short flying lead with a moulded in-line socket can be used instead. By using light-duty figure-eight cable, the transmitting LED could be 30m or more from the hand-held remote control without problems.